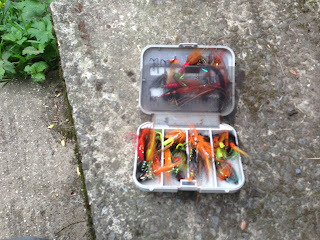 As a result of the recent run of decent fish being caught I was itching to get down to my usual beat on Sunday morning. There had been a small lift on Friday that had dropped back nicely and all looked perfect. I Put up the 13' 8# and tied on a good strong leader ready to do battle with the big fish that have been showing. After the usual head scratching of fly choice and rummaging around my disorganised fly box I opted for a pot bellied pig in black and orange. I worked my way down the beat thinking it looked so fishy, nice and overcast a cool but with very little wind. 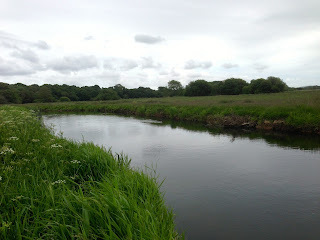 My fly was fishing nicely, a sudden jolt u the line beneath an overhanging but altered me to a vicious take. After a couple of seconds it became apparent that this was no Salmon, after a quick tussle a lovely plump sea trout of about 1 1/2lb - 2lb came to hand and was duly released. I fished down the rest of the middle section of the beat through all the spots that can be fished effectively with the fly. Once Tony arrived, about mid morning, I walked back to the hut for a coffee and a chat. We fished down the whole of the lower beat but were very surprised not to see anything other than one salmon that lazily followed and turned as it saw me. Once at the bottom of the beat a chap on the far bank had seen a huge fish in the big pool that often holds big fish, I lost one of about 25lb in the same pool a couple of years back as well as a sea trout in the 15lb class. 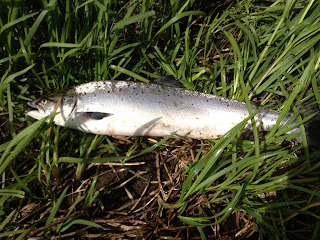 The chap said it was by far the biggest salmon he'd ever seen and put it at well over 30lb. Of course, we fished this pool well but saw nothing! After a quick lunch in the hut I headed up to the top of the beat and fished the whole length but again, to no avail. I decided it was time to call it a day as my confidence had all but vanished. 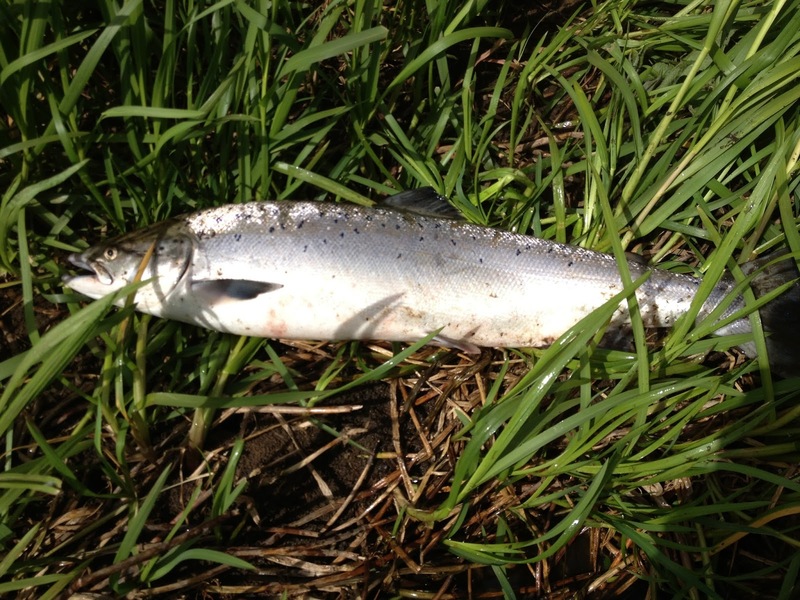 I thought it might be worth heading up to the beat a few miles upstream as it had produced a fish the day before. 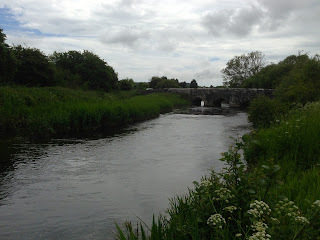 As my Friend was heading up there I decided to fish the very deep slow almost canal like stretch below the road bridge. It looks so un-fishy that I felt sure none of the rods on the syndicate bother to fish this bit so any salmon holding there would be relatively un-molested.Its a pretty featureless stretch and as fished towards the bend the water was a little faster, "this is where any fish will be if they are here" I thought. After a couple of casts in the faster fishy looking water I felt a hard pull followed by the unmistakable head shake transmitted up the line. By the time the realisation of what was happening dawned on me the fish went berserk and started tearing off of an incredible pace, after about 60yards it turned and swam back towards me. Struggling to get the line back on the reel I was hoping to get a glimpse of the fish as it shot past me. The fish stayed deep and managed to continue off downstream where it managed to swim under a big clump of ranunculus and everything locked up. The sprint downstream was not made easier by the thick reeds, nettles, thistles and hidden wooden posts. Once down stream of the fish pressure was applied in order to try and coax the fish back round the weed, a good plan but the fish had other ideas. After swimming back round the weed things started to look bad, really bad! As the fish struggled I could feel the weed popping as it was uprooted bit by bit, once the whole clump was removed I was thankful for the 22lb leader. After a couple more runs i managed to bring the fight to a conclusion and netted a lovely deep fish that was easily 16lb, at 34 1/3" it was deep and broad. as getting the fish back in the river was the priority there was only had time for a rubbish 'fish in net' picture that as usual does the fish no justice! Clearly this was not a lucky individual. Half of one of the gill covers was missing presumably as a result of getting caught in a mono filament net at some point. 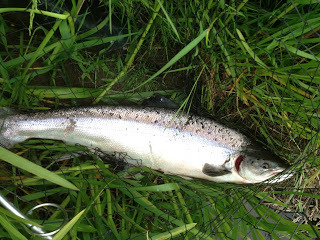 So, after fishing all the best spots and really fish looking bits I was more that surprised and very happy to have caught a good fish in the really rubbish looking, canal like bit that nobody else bothers to fish. As I always point out to the rods on the syndicate - fish it all, even the bits you think look rubbish, you never know where the fish will be! John who took the fish the day before in the fishy looking bit above the bridge forwarded me a picture of his fish that was estimated to be around the 12lb mark. The rest of the week will be spent planning my assault on the big fish pool where the 'monster' salmon is said to lurk!!!!! !